The first review I wrote for a general audience was a movie review for my high school newspaper, The Inkspot, in 1993. I was co-editor of the paper that year, and that was the beginning of a long relationship with newspapers (which only ended just last year). I joined the staff of The Daily Illini in the fall of 1994 during my freshman year of college, where I discovered the Internet, which had just started to become graphical and mainstream (although I would get my online reviewing start in the text-based Usenet). As I’ve mentioned in this space before, I actually reviewed the seventh season of TNG previously, in printed booklets that I never posted on the Internet (and never will). Jammer’s Reviews as you know them didn’t start until the fall of 1994 with DS9‘s third season. The official launch of my website came in March 1995, some 18 years ago. On the Internet, that’s an eternity for a niche hobby publication. Just ask the hundreds of other hobbyist website authors from the 1990s who have long since hung it up. That was before “blogger” was a word. I guess I’ve been a blogger since before the term for it existed. It’s fitting, I suppose, that things have now come full circle such that the completion of Jammer’s Reviews under its original mission statement of being the Internet’s most comprehensive Star Trek review website comes with the posting of my reviews of TNG‘s seventh season, only this time with reviews I’m willing to actually sign my name to. God knows it took me long enough to get here. When I announced the TNG project back in 2005, I envisioned it as two- or three-year project, tops. Yeah, right. Fast forward eight years and many delays later (granted, Battlestar Galactica ended up occupying much of that writing time), and tonight I finally post my review for TNG‘s finale, “All Good Things,” which holds up incredibly well after all these years. When you’re done reading this self-indulgent reflection on the conclusion of a project that would require far less reflection if I’d had the actual discipline to complete it in a time frame shorter than that of the actual series airing, you can go read the review. But this is a big moment for this website, which has comprised many thousands of hours of my life. For so many years there’s been this sense that these reviews would go on indefinitely, that the “TNG project” would take so long to complete that it would always be out there in the distant future, unattainable, on the account of my schedule, real life, and perpetually shifting focus (and, well, the possibility that I’d always find something new like a BSG or Caprica to take on). But now I don’t see a new ongoing project for this site in my future. So, then, what’s next for Jammer’s Reviews? The goal I set has been achieved. This website is as “complete” as it probably needs to be. Sure, there’s a new Star Trek movie coming in May, and you can be pretty sure I’ll be reviewing it. And, yes, I do still have the DVD set of Star Trek: The Animated Series sitting on a shelf, unwatched, which would make for a very logical addition to this website. I don’t know; we’ll see. I guess time will tell. I don’t have a concrete answer or plan. My only commitment now is to a lack of a plan. But I do have one last review of one last classic Star Trek episode. And it’s a true throwback review — a 3,200-word behemoth in the best tradition of Jammer long-windedness. I hope it was worth the wait. If not, too bad. Feel free to agree, disagree, or punch your computer screen. I have enjoyed your Trek reviews for nigh over a decade. I haven’t always agreed with you (“Balance of Terror” 2 and a half stars REALLY??? ), but you always state a solid case. For a long time up until Star Trek Enterprise was wrapping up, I always noticed this big glaring gap of a certain Trek series from your review roster. THE series. My series. And from 2006 on, I’ve been pleased to stop in for the last 7 years to see your POV on Roddenberry’s second Trek series that became a legend all its own. It was a show that was a life preserver in a time of great trouble. Reading your reviews of this shows entire run was like seeing TNG from another persons eyes and in a way experiencing it all over again. Thank you. I wish you the best in all you do, and I’m sure you will make a fine father as you are a reviewer. I want to thank you very much for all these reviews over the years. I have written a lot over the years in different places — comment sections, forums, livejournal, a blog I started and largely abandoned, things that never left my word processor — and I have always found writing both rewarding and intensely frustrating. It is not easy to maintain pace on a project at all, and for you to have gone through reviewing every episode of SIX complete series — the five live-action Star Trek series, and BSG — as well as 11 Star Trek movies and several others and some of Andromeda and Caprica — is an incredible piece of work. If you put this together, you would have several novels of length. I think this probably is the most comprehensive Star Trek review site in existence in terms of sheer quantity. That would be nothing if it were not for quality. Jammer — the standard disclaimer about how I don’t always agree with your conclusions (and so on). But I have read every review for the Star Trek shows (except Enterprise, which I stopped watching, and Voyager, where there were a few episodes I skipped — though I am sure I’ve read more than 90% of those reviews) and nearly all of the BSG reviews, as well as (say) the Lost reviews as that show wound down. I first discovered this site the summer after DS9 ended and Voyager’s fifth season had passed, and eagerly waited for each new Voyager review to trickle in, looking forward to them perhaps more than the episodes themselves (though yes, sometimes the show could be good). There were other reviewers I discovered around the same time whom I admired a lot — Tim Lynch is one of the giants, and the Cynic was consistently gutbustingly funny. But I loved your voice and still do — the nimble mixture of objective and subjective, emphasis on the shows’ quality as art and entertainment, character and plot, action and philosophy. Star Trek at its best was both a philosophical, moral, and psychological adventure and a ripping good yarn, and your reviews probably did as good a job as anyone at consistently asking how the shows stacked up on both fronts. Like Patrick, I too disagreed with your TOS rrating of Balance of Terror and thought that it was a 4 star classic But overall, I did agree with almost all your ratings and the fairness and thoroughness of your analysis. Your critical review of season 7 of TNG was on the money. Its hard to believe its almost over now…except for that new 2013 Star Trek movie. The void in your reviews of seasons 5, 6 and 7 has now finally been filled after many years today…and almost 19 years after ‘All Good Things’ aired. Its your call if your wish to review TAS. Now, I agree that hobbies take a back seat because family always comes first. I’ll read your review of ‘All Good Things’ in good time. After all, there’s no need to rush now. Good luck with your family. Cheers. I meant ‘the void in your reviews of seasons 5, 6 and 7 of TNG’ of course. Balance of Terror was one of only 2 TOS reviews I disagreed. The other was your 3 stars out of 4 stars review of ‘The Cloud Minders’ since the actress playing Droxine was weak and the gas mask solution was really very weak. But I got the gist of the episode. I felt The Cloud Minders was closer to 2.5/4 stars but at that stage of TOS, the producers didn’t really care about the show’s episodes–and it showed–as you astutely noted. Anyway, have a quieter life with your daughter….and I hope you can get some sleep too as a new father. I just wanted to add, DS9 ended in 1999. I was 12 at the time. 12. I am 26 now. I have been reading your reviews for more than half my life. Congratulations, Jammer! I’ve been a longtime visitor and fan of your reviews. It’s been delightful to take this journey back through TNG with you, as it has been for many series and movies before. Enjoy your family time, and I’ll look forward to reading your thoughts on Star Trek Into Darkness or anything else you may choose to write about in the future. It’s been a pleasure. Thanks for all your efforts. Look forward to your STID Review in May and hope you find time between family duties (hard I know) to maybe get TAS reviewed too. Thank you for all the writing you’ve done over the years. I first stumbled upon your website (‘Star Trek Hypertext’!) in probably 1996, when I was 16. I’ve been a devout reader ever since with only occasional big-time disagreements (“Take Me Out To The Holosuite” and “Far Beyond the Stars” are not good episodes, no matter what you say). You did a difficult thing very well. You provided strong criticism while still displaying affection for Trek. Too often, Star Trek criticism either comes from people who unabashedly love every episode or from complete haters. You found a great middle ground, and you were almost always a great read. Thanks for everything. I feel like, in a way, I grew up with your reviews. I know you’re busy with family stuff and all (and congrats on that!) but I sure hope I get to see your writing again. Thank you, thank you so much for everything, Jammer!! I’ll save up the “All Good things…” review for the right time, after all I’m just at the fourth season of TNG, but the review’s sheer length is looking good. It must be a great read. It’s so good to see you’ve such quality long time readers too, and when I think about it I’ve been reading this site for a little over a year now. I know why we keep coming back, this site is just fantastic. One of the things I enjoy the most of your reviews is that you aren’t a rabid Trekkie. Instead of bothering us with the useless little details like Warp speed and whatnot, you get to the core of the experience: Was it fun? Does the story make any sense? Are the characters evolving? Good luck to you and your family in all your future projects. Or should I say…may the force be with you? Or maybe not. Hah. Well I always knew you’d get here in the end Jammer; you should be very proud of yourself. I’m not quite sure how long I’ve been reading your reviews but I associate it with my earliest forays into the web. I must say this has been the definitive place to go for a reasonable opinion on Trek and Battlestar. I would also thank fellow readers too as there are numerous, surprisingly civil, conversations in the comments that make for some great reading. It’s been real! I still haven’t watched DS9, so I feel like my interaction with this website is just beginning because I plan to read the reviews after I watch each episode. When that will be, I have no idea. But it sure has been cool to have been a part of this project–if only from the sidelines. I’m kind of sad it’s over. I think I won’t read the last review for a while–then I know it’s still there. I just re-watched Caretaker–think I’ll go do that for a bit. I hate Twitter, but for a new Dad, it might be just the thing. Thanks for your dedication to this site throughout the years. I’m sad it’s over (Until we get a new Star Trek series) but in a way it won’t be because there’s still the movie to look forward to. Still, I’ve been reading this site since 2000 (When you were still reviewing Voyager) so it’s amazing how far this site has come and evolved over the years. Don’t worry about reviewing another series. Be the best dad you can be because that’s the most important thing in your life right now. Still, to end your goal with this episode is kind of poignent because “all good things must come to an end”. Thanks for Everything and enjoy Parenthood. I also must thank you for your dedication to this site (and Star Trek) throughout the years. Has it REALLY been 18 years?? Good Lord. As if such longevity wasn’t strange enough, for me it’s even stranger to find myself coming back regularly, considering I live in Argentina and I first stumbled upon “st-hypertext” back in 96, three years before having internet at home, back when I had to travel to a “cybercafe” to surf the web. This is just a good time as any to express my appreciation for your work here. You helped me shape my critical view over the years, and your writing has always been a companion read to one of my most enjoyable all-time hobbies, the Trek universe. I’ll surely be coming back from time to time and I wish you and your family all the best. I’ve been reading your reviews since … well, I’m not sure – at least 1997, I think. The better part of two decades. I’m a bit of a fan, I guess. For the most part, I’ve agreed with most of your lines of thought in your reviews. Like Guillermo, above, you were a strong influence in how I see television and film. When I find myself criticizing a foolish plot line, or lauding character development, I think it’s safe to say that you are partly responsible for getting me to think about what I am watching, rather than just be a passive viewer. Well, you and the Evil Overlord List, but that just dates me. It’s been a true pleasure reading your thoughts and opinions on a franchise that I’ve enjoyed for damn near 30 years. I seriously appreciate the time, energy, and money you’ve put into this site and its predecessors. I’ll continue to check in to see what you accomplish next…it’s sure to be interesting. Thank you, and best wishes for your future endeavors and family life. thanks for the reviews. I will stop in from time to time to see if you have any additions. the new trek movie looks good, so ill be back this summer! I’ve been visiting this site on and off for a few years now, and the reviews and insights have always been a great read after a watch Star Trek (some series I’m watching for the first time). TNG was the one which first got me hooked as a teenager, I think I’ll always have a fondness for it even if it can’t quite match the overall quality of DS9. I’ve tried myself to write a blog with all of Trek reviewed and I never got passed 4 seasons’ worth and the first 3 films, so I can really grasp how much dedication and energy it takes to achieve this (not to mention the quality to match the quantity). I think its awesome work and as I keep watching Voyager I’m looking forward to reading more of this excellent website. As I aside, I’ve made a start on watching Star Trek: The Animated Series and I am so far giving it a thumbs up. When fans point to the infamous shoddy animation I believe it is an exaggerated point, to be honest much of it is full of spell bounding colour and beauty. It’s only when people are talking or doing slightly more complex movements that the crudeness of the animation comes through, and even then it’s easy to adjust to. The stories are shorter, more direct and single-minded in order to adapt to the formatt of a 30 minute Saturday morning cartoon; so it makes for easy fun viewing. Much of the stories have been tight, suprisingly clever and chanelling the charm of the orginal series. All in all…I think you’ll get some enjoyment from TAS should you give it a chance! I very much hoped that you’d give this masterpiece 4 stars and not 3.5! (anything lower was not within the realm of possibility). “What You Leave Behind” was excellent, and DS9 as a whole was for me more satisfying, but the best series finale when considered along was without a doubt “All Good Things…” I find it amazing that with everything else that was going on at the time (DS9’s second season, the movies, Voyager), they were able to put together something so spectacular. 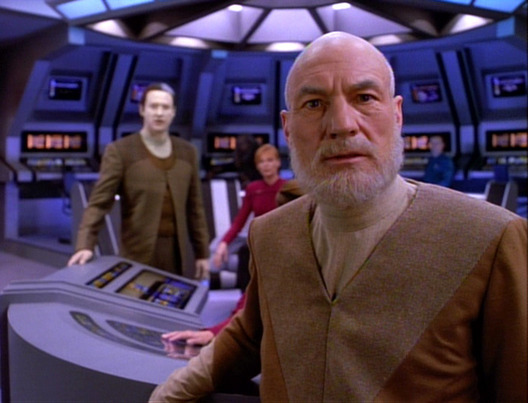 I have heard that Patrick Stewart in particular was exhausted from having directed “Pre-emptive Strike” and then appearing heavily in the finale. Maybe that actually helped his performance. Either way, it was Emmy-worthy. My favourite quote has to be when Q tells Picard “Oh, you’d like me to connect the dots for you, lead you from A to B to C so your puny mind can comprehend. How boooooring.” De Lancie’s delivery of that line is just perfect. And that last scene, the poker game, to me is still the definitive end for these characters. I couldn’t believe that they saved that for the very end (though Picard’s doppelganger did observe the poker game in “Allegiance”), but it sure was worth the wait. Irrelevant sidenote: have you noticed, Jammer, that no episode after “Inheritance” got a 3-star rating? I guess TNG’s seventh season was generally either excellent or mediocre (or terrible), never just ‘good’. Oops, sorry, I meant to post my above comment in the “All Good Things…” review page, not here. Oh well. I can only add to what others have said: THANK YOU Jammer for these great reviews! I have probably read almost all of them by now even though I’ve known about you for only a few years. I have even read reviews of episodes I haven’t seen (and have no intention of seeing). Your reviews for bad episodes in particular have been a hoot, much more entertaining then those episodes themselves. Also, thank you for making me aware of “Battlestar Galactica” and “The Wire”, two great television series which I have now seen from start to finish, in no small part because of your praise for them on this very site. Thanks for the callback to punching my computer screen! I’ve missed that line from the season write-ups of yore. I think it’s fantastic it’s taken longer than TNG ran to finish up the reviews…it’s just made clicking on my bookmark more rewarding when there WAS an update, since I’ve not gotten around to adopting RSS. Thanks Jammer for many years of entertaining writing and excellent reviews, and I’ll look forward to the occasional update from here on out. I’m not sure exactly when I first started coming here…I remember reading Voyager reviews in real time, I suspect it was the 6th or 7th season of that show, so that would be somewhere around 2000. 13 years! I’m pretty sure yours is the oldest favourite in my browser favourites, and it still points to st-hypertext.com so I’m glad your redirect still works =P I remember when there was no comment section, that was a great addition, adding a sense of community in some ways. It’s been a fantastic ride, great to see the collection complete! It’s funny the reviewer-reader relationship, you come to trust and understand someone’s perspective and, even though they’re a stranger, you want to know their opinion about some new thing. I suppose that’s why I was so excited to see your articles on Lost. It’s just nice to hear the pros and cons from a reviewer you think you understand. So yes don’t think you have to take on episodic reviews (although they’re always nice). The occasional short piece about Game of Thrones or The Walking Dead or whatever you happen to be watching would be interesting too! As someone who started reading you on Usenet (was it rec.arts.startrek.reviews.moderated? That seems to be what I remember typing into the university computer terminals), I can attest it’s been a very long time! I’ve always enjoyed your reviews, even when I have have a different opinion. To have written out your thoughts on every episode, going through all the good and not-so-good episodes, is quite the accomplishment. I’ll be checking in to see if you add anything here; good luck with whatever else you do! Reading this entry made me feel old – I stumbled across this site midway through Deep Space Nine Season 4, so have been following it for over 15 years – it still for me sets the benchmark for Quality reviews – I think you are being a little hard on yourself as BSG (of which the reviews are probably as impressive) took up a significant time commitment! Suffice it to say, I must have spent hundreds of hours reading through these reviews so it will no doubt leave a void with myself and every other one of the commenters here! I wish you all the best in your future endeavors – it has been a privilege to read such eloquence sustained over the better part of two decades. Good luck with any future projects you might undertake! These reviews have been great accompaniment while watching (and re-watching) some television that I’ve really loved. After most of my friends and family stopped caring about this stuff much, it was a real treat to have some intelligent commentary along the way. Usually, I agreed overall. When I didn’t, there was engaging writing and I at least had something to think about. Just wanted to say how much I’ve thoroughly enjoyed the ride. I hope to check back from time to time. Best wishes! Wish you the best Jammer. Thought: There are LOTS of SCI-FI movies out there!! Pick one a week or something like that just to keep this thing alive. As someone that didn’t watch any of these shows as they aired, I enjoy coming here and reading your reviews. I find it interesting I don’t agree with all of them. It would be awesome if you wrote a review of the upcoming “Star Trek Into Darkness”! These reviews really helped save a fellow dad/career person go through all the old ST shows. Besides your unnatural hatred of the Ferengi I agreed with nearly all of your star ratings. Every once and a while I would ignore your warning to the detriment of an hour of my life I’ll never get back. Just wanted to say I have always enjoyed your reviews and in the main, agreed with them. However the main reason I dropped by was to see if you had reviewed Star Trek: Into Darkness yet (which I saw last night). You really, really should. Now that would be a review worth reading I am sure! Star Trek Into Darkness doesn’t open in the U.S. until Friday. I probably won’t be able to see it until as much as a week after that. But once I see it, I plan on writing a review. your reviews added a new level to my enjoyment of Star Trek by effectively allowing me to see the episodes from someone else’s perspective (I don’t have a lot of friends who were Trekkers to have such conversations with). And in any event, even if I did, I think the quality of your insights is better than most. I don’t always agree with your reviews, but it has been fun to read them. This blog post read to me like a “series finale” for your reviews and honestly, I got a little sentimental and sad (both personally and perhaps vicariously on your behalf) to read about the conclusion to such a substantive project in your life. It feels like you’re letting something important to you go and I get that same feelign reading this post that I’ve gotten watchign series finales for some of my favourite shows, and knowing that there won’t be anything coming. I also add to that the feeling I know I’ve had lately with marriage and a family starting that projects I’d long hoped to complete start to get “back burnered” and you start realizing that certain things have to go from your life and never come back. I hope things are well for you. Congrats on the little girl. All the best in your future endeavours. I look forward to your review of Into Darkness, and any future Trek reviews you do. Think of them as those films themselves that manage to bring you briefly back into the Trek world after the TV shows have finale’ed. For the past few months I’ve been re-watching all TNG/DS9. How fortuitous it was to discover your website just as the Trek marathon began. I don’t *always* quite agree with your reviews – though I often do! – but in any case they’ve added a new level of enjoyment to these shows and I scarcely watch an episode without also reading what you think about it. It’s also a pleasure to find this site so active – I just concluded watching TNG with “All Good Things…” and was surprised to learn that you only completed the review a few months ago. Thank you for so many years of entertainment Jammer! I remember finding Star Trek Hypertext back in 2003 or 2004 and just absolutely loving everything about these reviews. I’ll always love the reviews like Demon or The Disease for pushing the envelope on how a review could be but my favourite is probably the one for Enterprise’s Damage. I think all your folllowers would love to see more random reviews for films if you ever chose to do that, whether current or past, you’re writing is just really fun to read and look at things or explain things that one might agree or disagree but someone like me can’t really articulate into words. Cheers for many many hours of enjoyment Jammer! Thank you Jammer for your contribution to the Star Trek Universe. As someone who has also followed Trek like you from college to now career/family, I applaud and salute your dedication to this site. We will follow your blog and hope you stay active in these comments. May this website stay up until it becomes part of LCARS. Just responding to Patrick’s first comment with a bit of shock. Jammer — is it true? You haven’t watched Firefly? Like Patrick says, whether you review it or not (but man, I’d *love* to read your reviews on it), I dare say it’s right up your alley. Thanks for all your work, man! I just finished researching for the n^th time, “All Good Things…” And is customary after I view a Trek episode, I immediately went on your reviews. I clicked the link to read this intro before I read the actual review. I teared up at the end of “All Good Things…” but reading what you wrote here really gave me a sense of “wow, it’s over.” That your reviews could affect me in that way really says something. Thank you.